Q: I see everything from 30 seconds to four minutes as the best rest to take after each set. Which should I use for building muscle mass? A: The most important principle to consider about rest intervals and how they affect bodybuilding is that there is an inverse relationship between reps and rest: The more reps you perform, the lighter the weights you must use and the less rest you need. Most American exercise physiologists recommend a 1-5 ratio of work-to-rest for training the ATP-CP system, which is the energy system involved in high-intensity muscular contractions. A 1-to-5 ratio means that whatever time it takes you to complete a set, it takes you five times as long to recover adequately from the set. Still, not everyone is in agreement with the Americans in the field. Canadian exercise physiologist Norman Gionet believes that a 1-5 ratio does not provide sufficient recovery for the ATP-CP system; he recommends a ratio of 1-to-12-to-18. The late sprint coach Charlie Francis was also a strong believer in long rest intervals. He suggested a ratio between 1-20 and 1-30. I am in full agreement with that. A nervous-system cell takes five to six times longer to recover than a muscle cell. So, even though energy stores may be nearly replenished by a ratio of 1-5 or 1-6, your nervous system has not recovered enough to activate effectively the fast-twitch fibers responsible for muscle growth. And if the nervous system cannot activate the fast-twitch fibers, what is the point of performing another set? Although counting repetitions is a convenient way to determine work performed, it is more precise to consider how long it takes to complete a set. The amount of time it takes to complete a set is referred to as the “time under tension,” or TUT. As with reps, the longer a muscle is stressed, the less rest it needs between sets. Because variety is an essential training principle, I believe it’s also important to vary your rest intervals. Despite the established cause-and-effect relationship of varying rest intervals, failure to do so limits adaptation to the training stimulus. This concept has yet to be validated in the scientific literature, but it has been my experience that it positively favors the rate and magnitude of strength and size gains—especially with elite athletes. In addition to reps and sets, there are several other factors to consider when determining rest intervals. I’ll address three of them here: training experience, muscle mass and strength levels, and aerobic fitness. Training experience. Tolerance to short rest intervals with loads in the 60 to 80 percent range (six to 20 reps) is a function of years of accumulated training. The lactate buildup resulting from that type of training is tolerated only by the well-conditioned trainee. Therefore, rest intervals must be shortened for advanced trainees only, as in beginners the lactate buildup will interfere with proper exercise performance. In fact, to prevent excessively high lactate buildup, I frequently alternate upper- and lower-body exercises in the workouts I prescribe. Muscle mass and strength. The bigger and stronger a trainee, the longer the rest interval should be. There appears to be a direct linear relationship between the length of the rest interval and the bodyweight of the trainee. Thus, a heavyweight bodybuilder would need a longer rest period than a lightweight. Aerobic fitness. The more aerobically fit an athlete is, the shorter the rest interval should be—that’s the theory. The problem is that aerobically fit individuals are normally weaker and have physiques with minimal muscle mass. It’s also been my experience that they tend to rush between heavy sets to maintain a high heart rate. Apparently, they have a hard time grasping the concept of resting for a long time between heavy sets to bring about neural adaptation. Unfortunately, a high heart rate by itself does not lead to maximum strength and mass gains. A weightlifter or strength athlete must emphasize complete recovery, but a bodybuilder has two choices when selecting the rest interval: nearly complete recovery or incomplete recovery. Here’s an example of inadequate rest and decreasing weight. 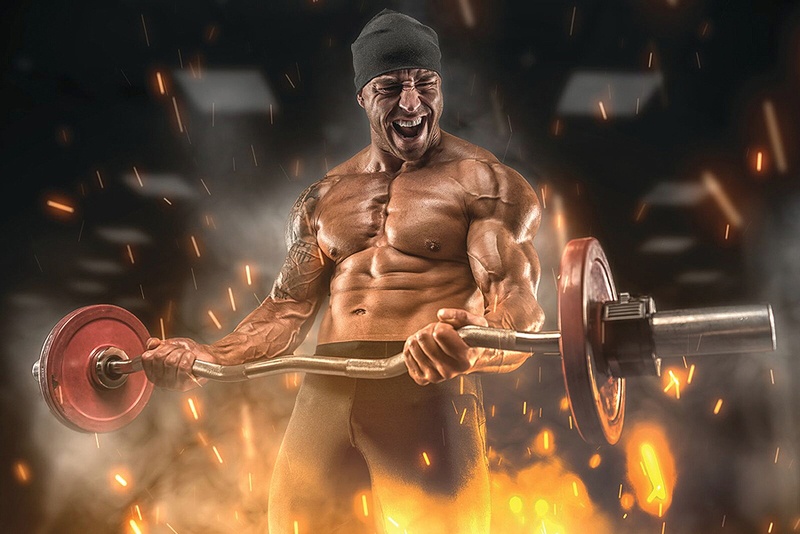 That option is often used by bodybuilders for the “pump” sensation that comes with it and is associated with high levels of growth hormone and lactic acid. It also increases the storage of glycogen and phosphagens and the associated enzymes for their metabolism. That method creates hypertrophy but not for the same reason that heavy sets with long rests do. Heavier weights and longer rests favor growth of the contractile proteins, while the above method promotes hypertrophy through energy substrate storage. It follows that to stimulate maximum muscle mass, you need a combination of methods. Bodybuilders should use both types of recovery systems: nearly complete and incomplete. The bottom line is that you need to vary the rest intervals to trigger optimum progress in bodybuilding. Are Detox Diets and Juice Cleansing Absolutely Pointless?